August 14, 2018 mudslide showed that Sierra Leone had one of the highest rainfalls in the sub-region and one of the wettest. Freetown is particularly prone to floods because of free and clumsy human activities like deforestation, slum settlements along waterways and hilltops and poor waste management that block drainages and other waterways. The 2017 rainfall, causing mudslides, left the Matormeh Community, just outside Freetown, wholly devastated, killing over 1000 people. 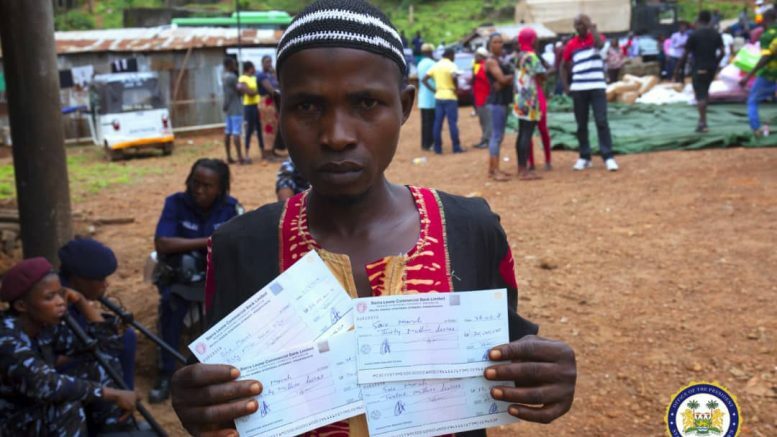 In fulfillment of promises made to give a human face to the repatriation and resettlement of people in the community, the process has commenced. Today Wednesday 27 June 2018 the government of Sierra Leone, under the dynamic leadership of President Julius Maada Bio, has given over Le7.2 billion to 86 households in the affected community at Regent village. 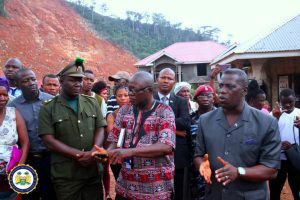 The occasion took place at Matormeh where the community chief, Abdulai Kamara, said that they were thrilled and pleased by the proactive steps of the government to repatriate them before the rains intensified. “We all know what happened last year in August when a mudslide killed over 1,000 of our countrymen. We don’t want the same to happen to us. That is why we are happy for this step in relocating us from this danger zone,” he said. The Chief Minister, Professor David Francis, thanked the people and beneficiaries for their patience and readiness to be evacuated from a community where they had lived and created so much comfort for themselves. Professor Francis said the government was passionate about the wellbeing of citizens because the incident that occurred on the 14 August 2017 didn’t only shock Sierra Leone but the world at large. The Chief Minister also reassured the people of Matormeh of government’s commitment to care for them, adding that that was the reason why everybody would be receiving a cheque that reflected the worth of the houses, relief and food items they deserved. The demolition is set to happen on the 13 July 2018, by which time everybody would have taken all their valuables in the various houses within the designated Red Belt areas. Inspector Marie Kamara is a beneficiary of the repatriation who received a cheque of 300 million. She thanked President Bio and the government for giving them hope after a long fight with the previous government, adding that the evacuation was in their interest. Be the first to comment on "Government Gives Over 7.2 Billion To Matormeh Occupants"